Josh and I sat down to watch the NRL semi final this evening between Newcastle and the Roosters. Well, I sat down. Josh had his ball (his Sherrin, mind you), stood in front of the TV, and played out every play as it happened. He didn't go the full 80 minutes, but I reckon he was doing it for at least 50 minutes of the game. For the rest of the time he was able to mirror his father, by having a drink and some chips while watching the game. Yes, I guess I have made a few "this is my last game/season" remarks in regard to cricket. Funnily enough, however, given that my body could stand up to the rigours it was going to face, I was keen to have another run around in the 2013/14 season. 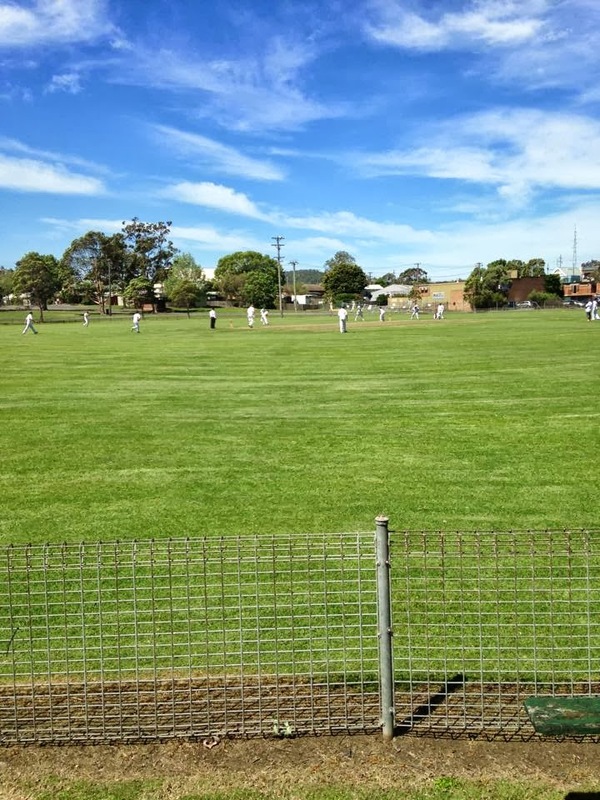 The chance to play a bit more cricket with my eldest nephew Zac, and possibly even some with Zac's younger brother Flynn, and one last chance for my own kids to see their old man do something useful and almost physical, meant that I was happy to have a run. i wasn't sure when that might occur, but as it turns out it happened a bit sooner than I expected. 2nd Grade started today, and through the week I was interested to see such names as Steve Norris, Jason Wills and Gavin Hartley all listed to play. At the time I thought, "Wow, it would be great to have a game with those guys again". In fact, it turned into quite a talking point on a post on Facebook late in the week. Then the offer came from skipper Dave Timbs to join the crowd, and I jumped at the chance. The result? Well, the report is here to read if you are interested. I made five with the bat, felt comfortable, and then blew it by playing a rash shot. A shame really, but hopefully I can do better next week. With the ball, I got caned - 2 overs, 0/28 and at least three sixes over the fence. The kid who took me hit it cleanly, and they weren't all bad balls. Again, hopefully next week if I get the chance I can redeem myself. But the day was a joy, a lot of fun, just like the old days. No doubt it is going to hurt for a couple of days, but I hope I can get through more of this season, because I think we can have a successful one. But it will be fun. Majority Rule decided that the weather was almost warm enough to make a trip to Little Lake at Barrack Point (or Warilla, depending on who you are trying to impress), and so off we traipsed to see what the water was like. Not too surprisingly, it was still quite cold, but the kids ran around for about an hour and a half before Maddi decided to cut her foot on the rocks running along the base of the tidal movement. This prompted a lot of crying, and then followed some vomiting in the car just to top it all off. This, though, appears to be from a little stomach bug she is carrying around, and not from anything that occurred in the water. This evening the two footy finals were on, and the choice of what game to watch is always a problem. Not with the girls - Helen was in the family room watching... well, something, and the girls were upstairs watching some movie or another. Josh and I were in the Metal Cavern, and though I am subtley nudging him towards AFL, he is much more interested in watching the NRL, so we settled in and watched the second semi-final between Newcastle and Melbourne together. It was the first match where he has sat and watched the whole game without getting up and down, which was good. better yet, the Knights beat the Storm and kicked them out of the finals. Another day, another school event. Today, I took Jessica to Mt Brown Public School to take part in the Regional Final of the State Spelling Bee. A few weeks ago Jess had been chosen to be Albion Park Public School's representative in the Year 4 group, and today was the day. She, along with all of the participants, did amazingly well. The pressure and stress on all of the kids was tremendous, and after the first round, the words became extremely difficult. It was a little bit hit and miss as to the difficulty of the word you received, and some problems occurred in the the running of the show. However, Jess made the fourth round, when there were only 15 of the 50 starters remaining, and it was a shame when she didn't quite get through with the spelling of "immunology". However, only six kids remained after this round, so she had done amazingly well, and with little apparent problems. To say I was proud of her would be an understatement. She was just terrific. And it was great that both Helen and I, and three of her four grandparents could be there to see it. On our first day back in the country, we had to attend the school for another awards ceremony. Thankfully, after having missed out last term when Jess and Josh both received their colour behaviour awards, this time it was Maddi who picked up her award. All the kids did a couple of musical numbers as well, and Josh showed his prowess in singing and actions - and how much he has progressed in this regard during the course of the year. Though we were a little late in landing, we arrived back in Sydney at 6.15am, and were greeted by grey clouds and lingering rain. All a bit different from what we had been used to. More delays, in again taxiing to their furthest part of the airport, then having to wait for cargo to be moved so we could disembark, jump on a bus and be driven back to the terminal, and then line up to get through immigration and customs, had Mum and dad and Helen well over the chances of ever travelling on Virgin again. Still, to me it was just another area where we had to be patient with the queues. We found our bus driver, hopped on board and were driven home to our door, at which we arrived almost spot on 9.00am. This was somewhat counter-productive, because Chris & Chris and the kids didn't show up for half an hour, and we had no key to get in, so we had to wait on the Deck with an old copy of the Lake Times to keep us amused. It was great to see the kids, who were very excited, and glad to see both sides, grandparents and grandkids, ha had a good time in our absence. The handing out of the presents bought and the viewing of all the other purchases kept everyone amused after the breakfast that Chris & Chris had brought over. The remainder of the Sunday was spent in recuperation, with the kids playing, Helen snoozing and me watching the footy. Today was our last day in Bali, possibly for a very long time. I seem to have finally tracked down a slight stomach bug, one that didn't really affect anything I was doing, but you can just feel a little off-centre with it. No big dramas. We had to be out of our room by 11.00am, so we left our bags up at reception, and spent the day around the pool, doing pretty much the same as we did yesterday. The pool was great, and I spent a fair amount of the day standing in there, knowing it would be a long time before I was in a pool again that had this fantastic temperature. Helen in one of her new dresses. We showered and changed at 5.00pm in a room we had hired for an hour, and had some dinner at the Sports Bar before our transport to the airport arrived at 6.30pm. Once again we were met with big lines and few people on to clear the rush, but the family with about 11 members and 43 pieces of luggage seemed to hold up proceedings more than anything else. More delays in processing and lining up for buses to take us to the plane and finally taking off about 40 minutes late, as well as no space for overhead luggage for those of us that had been shoved right down into the last row of the plane did not endear anyone to Virgin's capabilities compared to Jetstar either. Another day of lazing around the pool was designated for today. Helen and I went for a walk down along the beach path, past a lot of the other hotels, before cutting back to the main road and checking out the remaining shops we hadn't yet seen. From here though, the pool and pool area beckoned. I have spent more time in a pool this week than I have in possibly the past ten years combined, but with the water temperature and depth very compelling it has been an easy task. Then flop your way out of the pool to your chair, and order a drink or something to eat, and read your book, and then do it all again. I finished Arnie's book a few days ago, and today I finished "The Cuckoo's Calling" by Robert Galbraith, which is actually the pseudonym for J.K. Rowling, writer of the Harry Potter series. It was an easy and enjoyable read. I'm looking forward to her next effort now. Who said I never swam in pools?!? Dad and I ventured up to the sports bar for the AFL at 5.30pm, though we only saw the first two quarters due to a late start. From there we headed back to Coco's for another meal and more of the house band that we enjoyed a few nights ago. After two terrific days in Ubud, it was time to return to the quieter, slower and more relaxing atmosphere of Peninsula Beach this morning. We found the full wrath of Bali traffic en route. Having wondered just how easy it would be to be involved in a dangerous accident in Bali traffic, we experienced one on this trip, which I viewed from the front passengers seat. Two motorcycles had whizzed up the inside of our transport, with one making to overtake the other. Of course, as soon as they did, they decided that they wanted to turn into the upcoming petrol station, and turned right in front of the motorcycle they had passed. That cycle of course then went headlong into it, putting both on the ground, and the one at the rear slipping out right into our path at 75 kph. Our driver had nowhere to go, and went right over the rear wheel of the downed motorcycle, missing the girls leg on board by centimetres. We kept an eye through the rear vision mirrors as we continued on, and saw both cycles and their passengers stand up mostly uninjured. It was a knife's edge from being very nasty, but as Dad said, there is no insurance in Bali, so anything that happens is considered bad luck. the lack of injury made us feel better about not stopping and possibly incurring the wrath of the local police. So it was back into relaxation mode, as we alternately swam in the pool, lazed by the pool, or relaxed in the room. Our second day in Ubud started with a trip up to the lakes in the highlands, a trip of about two hours. Mum and Dad both wanted us to do this, mainly for the actual trip, which would take us through the 'real' Bali, where the farms and countryside really was. and it was a good trip, and some of the views were spectacular. We made it to Lake Bratan, where the Temple on the Water, Pura Ulun Danu Bratan, is located. We walked around and took some photos (Helen's face is priceless, if only she would stop talking while her photo was being taken! ), and also checked out the small markets there. On our way back, our transport driver (no doubt on a retainer to take us) suggested we stop at a coffee place, where the tour not only showed us the different coffee and coca plants they have, but the dozen or so different flavoured coffees and teas they make there. we were also given the opportunity for 50,000 rupiah (about $5 Australian) to take the Mongoose Coffee. What makes this so special is that it is made from coffee beans that are eaten, and then excreted, by a mongoose. Apparently the mongoose only eats certain types of beans, and this is what makes the coffee so special. We all declined the invitation. However, they were able to make a couple of sales of other products in the 'gift' shop that followed. On return to Ubud, it was time for the girls to fully explore Monkey Forest Road's jewels of shopping, while, after a suitable time frame of trailing and watching, Dad and I headed for a bar about halfway down the street, and watched the passing parade once again. From here we braved the markets, which had also changed from my memory, but was obviously only a recent change as Mum and Dad had been only 18 months previously. We were going to head down to town for the Barong Dance that night, but a ferocious storm hit just before 7.00pm and went on for almost an hour, putting paid to any chance of doing that. We played cards outside Mum and Dad's room until the rain subsided, and went out for dinner instead, before returning to do a bit more reading for the rest of the evening. After breakfast this morning, we bade farewell to our Peninsula Beach resort, as we headed for two days in Ubud, which Dad titled "the cultural centre of Bali". We had transport from the hotel, and settled in for the hour and 45 minute journey from Tanjung Benoa. The traffic was as chaotic as ever, what I would class as organised chaos. Everyone seems to know what they are doing, but there are the usual many close shaves when it comes to bingles or scrapes or just plain running someone down. Why anyone would ever hire their own car or motorbike in Bali and drive themselves is beyond me. We arrived at the so-named Honeymoon Suites around midday, and waited a while for our rooms to be ready. They are different from our other two hotels, much more in the traditional Bali style, something Helen was ecstatic about. Then off we went to explore the new town. Even though it has been 22 years since I was last here, I still couldn't believe the change that had occurred. When I last came it was still a country town, with some bustle around the markets, but not a lot else. The one cafe I remember was the Lotus Cafe, with Ubud Music across the road. They're still there, but they are now surrounded by suburbia. we walked down the hill so Mum could get to her favourite shop for fabric and such, while I took a couple of photos off the bridge. they don't show the true depth of the valley. We had afternoon tea at the Casa Luna Bakery. As it turns out, we had dinner there as well, downstairs in the secondary dining area. It was all very pleasant. In the afternoon we swam in the pool, before we had happy hour on the balcony outside our room. Helen took some photos of the view. After four fairly full on days, it was time to relax, and so today was marked as a 'rest day' on our calendar. Which is pretty much what we did. We had breakfast, and Helen had reserved four lounge chairs on the beachfront between the ocean and the pool. We all took our books, and alternated between swimming in the pool and lying on our chairs reading. I had been reading "My Incredible True Life Story", which is Arnold Schwarzenegger's autobiography, which given its length and detail was proving to be a good holiday read. Along with this, we had the locals walking up and down the path, offering us the chance to purchase DVDs, CDs, sunglasses, jewellery, paintings and the like. The hotel's two drinks waiters came around every half hour or so, asking if we wanted anything to drink or eat. Mum also awaited the arrival of her favourite, the ice cream man, who sold Magnums and Cornetto's and the like. All in all it was a very tough day indeed. Out again for dinner, after which we moved into the sports bar again, but this time for Karaoke Night. Like all karaoke, it was very slow to start. Thankfully the MC could sing, and he did a few numbers, with a couple of stragglers throwing in a song, none of which could sing to save themselves (yep, it's karaoke all right). So yes, I decided to have a go, if only so that some songs that i like would be played. So I initially got up and did Elton John's "I Guess That's Why They Call It The Blues", and was immediately encouraged by said MC to do some more. I declined, until a couple more went by and there was still no jumping, so I also did The Eagles' "Take It Easy". From here, things picked up as three of the most boisterous people in the place arrived to take charge, one of whom could really sing! With four microphones passed around the crowd, the night turned out to be a really good one, especially when the Pommie wedding party from the hotel next door came in and joined the festivities. The groomsman absolutely nailed Guns N' Roses' "Sweet Child O' Mine". By the time we retired for the night at midnight, it had been a terrific relaxing day. Another hotel, another all you can eat buffet breakfast. Another EggMan. More table service for coffee. Different but same. Still eggs and bacon and sausages. After heading back for a quick dip, Helen and Mum journeyed across the road for massages while Dad and I headed back to the sports bar to watch the final AFL semi-final between Richmond and Carlton. The scene was as chaotic as it was yesterday, and another great game of footy. No doubt the girls were much happier not being there. We moved back to our rooms after the game, and again Skyped the kids to see how their weekend had gone. After happy hour we went out to dinner again, this time to one of Mum and Dad's favourites, Coco's. As we ate our dinner (satay again for me) we were entertained by a three piece band playing lots of crowd favourites from the 60's and 70's. They even asked for requests, and when I asked for The Beatles' "Let it Be", they had no trouble in complying. They were great. Once Dad found out that the band was back on Friday he immediately enforced that we would return that night. Today was our final morning at Kumula Pantai, where breakfast has been one of the highlights. We went for a final walk around the local streets before leaving, with Helen commenting "I've done all my shopping. Now it's over to you". Everyone should remember that comment for other times during the coming week. I did buy three singlet tops, marking my first purchases of the holiday that weren't Bintang oriented. I have been looking for sports team shirts of teams I follow, but for the American and English teams I support, they just aren't the big sellers, so no one seems to stock them! There are no NFL shirts, so my dream of a Dallas Cowboys shirt is stillborn. Nor are there any NHL shirts, meaning the Nashville Predators also miss out. In the NBA my team is the Portland Trail Blazers, but no joy there. MLB? No, no Seattle Mariners. What about the EPL? No, you can't find a West Ham shirt for love or money. So, I bought normal singlets, and was done with it. As I have worn my Collingwood cap everywhere, I have everyone trying to sell me magpies merchandise, but I already have official stuff at home, and it is mostly the same with the Eels stuff that they try to give me. Oh well, you can't have everything. Dad organised transport for us to our new abode, Peninsula Beach Resort at Tanjung Benoa, at the southern end of the island. This is where Mum and Dad have their timeshare place, and it is a great set-up. Pool overlooking the beach, restaurant and bar right next to it, and sports bar at the front. We arrived just before 1.00pm, but our rooms were not going to be ready until 3.00pm, which gave us the perfect excuse to immediately hit up the sports bar to watch the second AFL semi final between Geelong and Fremantle. It was completely open, so there was no air conditioning apart from a few fans, so it was warm. The girls were not enamoured by it - warm, packed with fans watching the footy, all being loud and parochial with plenty of beer being drunk and friendly banter between both sides of the supporters gulf. In fact, the exact same reasons why Dad and I loved it! Better yet, Freo upset Geelong to move into the preliminary final in two weeks time. The room was terrific, large, airy and with kitchenette and lounge area. From here we donned swimming apparel and checked out the pool and its surrounds, before 5 o'clock happy hour at Mum and Dad's room. We had dinner across the road at one of the many eateries available, where I continued on my quest to have satay as many times as possible while I am away from Jessie's peanut allergy. Today was election day back home in Australia, which was something I think all four of us were happy to miss. However, it meant that there was no live coverage of the AFL semi between Collingwood and Port Adelaide, which was somewhat annoying. Not as annoying as watching the election coverage instead as the Liberal/National alliance romped home mind you. Can't wait to see how the next three years goes now. To top this off though, the delayed coverage of the previously mentioned match brought about defeat for the magpies and their elimination from the finals, thus ending the day on a very sour note in all circumstances.